You take a look at your calendar, and you notice that you’re upcoming move is less than a week away. You have been through the moving process a couple of times, and you know that on moving day, you’ll be hungry in no time! As you think about preparing meals for moving day, you realize that you don’t have an much time to unpack as you did during your last move. You’ll only have evenings and weekends to get settled in. While this isn’t a big problem, you realize that that means that you’ll probably need to cover a couple meals before everything is unpacked. As you begin to think about preparing meals for moving day, you remember that you’re trying to save up for that trip in a month, and you want to save every penny you can. So, while it may be more convenient to order in food, it would be more cost effective for you to meal prep. If you can relate to this situation even a little bit, here are some tips on things to remember when preparing meals for moving day. As you think about preparing meals for moving day, here are some tips on what to use, and how to prepare different meals for moving day. As goes for your move, the more rushed you are, the more challenges you will have. If you have time to sit down and plan out what to eat on moving day, you stand a better chance at being prepared, and being able to eat something nutritious, instead of being forced to order in. On moving day, things happen quickly. Along with getting ready in the morning, to finishing any last minute packing, often breakfast is a last minute after thought. Instead of having to run to the local fast food restaurant to grab something to eat to just get something in your system, plan out breakfast. Whether it’s leaving some milk and plastic bowls out for cereal or making some breakfast wraps that you throw in the freezer or fridge. Make sure to start your busy moving day out with something in your stomach, and don’t forget breakfast. As your move day unfolds, you often realize that it’s going to be a full day. You’re going to need something to sustain you as you go throughout your day. This is where snacks come in. While you may consider running to 7-11 to grab a bag of chips, preparing meals for moving day can ensure that you have snacks for the entire day, rather than a bag of chips that may last you 15 minutes. Putting fruit into small zip-lock bags or getting a big bag of nuts and portioning them out can a healthy option. As your preparing meals for moving day, you may look through your fridge and notice that you have quite a of leftovers. Instead of throwing them out, bring them along for lunch, or dinner at your new place. While throwing out food can be easy, re-heating leftovers can be a great way to save a few bucks. As you sit preparing meals for moving day, your oven can be a great and easy way to prepare food after you move into your new house with minimal effort. 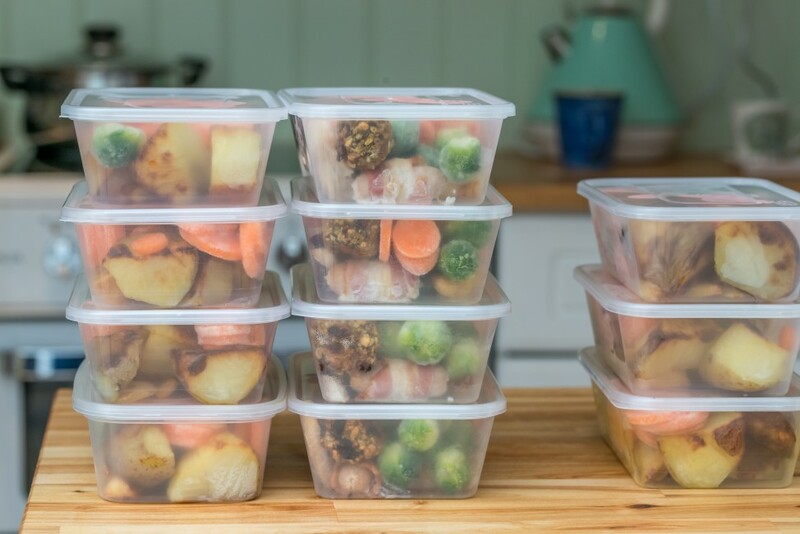 While all your plates and pans may still be packed away, having frozen meals can help ensure that you have something to eat before you need to, or can, start unpacking your kitchen. It will give you easy meals that don’t require much preparation in your new home. Along with using leftovers, intentionally cooking meals with your new home in mind can help you save some bucks in your new home. As you are preparing meals for moving day, cooking a big pot of chili, making a big portion of chicken breasts, or a big pot of pasta can be helpful in your new home. Take the time to cook with your new home in mind. If you’re looking to save a bucks on your move, preparing meals for moving day can be a great way to ensure that you have something to eat, and also, a great way to save a couple bucks on take out food. While ordering in a meal may be easier and while one meal may not cost all that much, the costs can sure add up fast. Especially if you think about your unpacking situation. For example, if all the time that you have to unpack is evenings and weekends, if may take a couple of days to get unpacked to the point of being ready to put together a meal, and those costs can sure add up quickly over the course of 4 or 5 meals. Here are some tips, on how to best unpack your kitchen. If you know that you’re going to be moving in the upcoming months, make sure to plan for your move by giving Quick Transfer a call. Our knowledgeable staff can help you get your move set up with our free no-obligation quote, and our experienced team can work to give you a stress-free move. Whether you’re moving locally within Winnipeg, or across a couple of provinces, Quick Transfer is your trusted and experienced mover. Make sure to reach out to us today!